We are leading Suppliers of Business Card Cases. We have a wide range of different models available throughout the year. The card holders imported by us are of very premium quality & extremely fairly prized. We also provide facilities of printing, engraving & speedy delivery across India . Unique Slim Vertical Card Holder in black colour which will age beautifully. Genuine Leather - Premium Full Grain Vegetable Tanned Leather. Plastic compartments inside, mest material can be used if requested by client. We are proficient in providing our clients a wide range of business card holder. These are provided in both metal and plastic variety. It has a large capacity to hold a minimum of 100 cards easily. It makes it easy for the client to keep business cards in one place easy to access. These can be kept on the table in the Office. We are involved in manufacturing and exporting Business Credit Card Cases, which are used for holding credit cards and other ID cards. These cards are offered in various designs and classy patterns and can also be used as a fashion accessory. 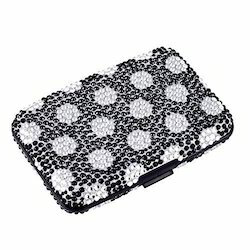 Our customers can buy these credit card cases at competitive prices from us.